Alexandra Horowitz’s new book, Being a Dog, is as much about being — and sniffing as — a human as it is about dogs and their world of smells. Horowitz does a great job breaking down the science of how dogs smell and how humans do (or, rather, fail to). I finally understand how different the dog’ s sense of the world is, in a way that superficial comparisons of the number of smell receptor cells dogs and humans have never could convey. Dogs process and understand smell in a completely different way from humans. Smell is an entire language. Sniffing stuff on a walk is like reading an entire encyclopedia. Horowitz says that dogs don’t judge smells the way we do either. Smells are information; neither good nor bad. That explains a lot! A couple of weeks ago, I described “smell walks” but I wasn’t sure exactly how these were supposed to work. Jana will be devastated to learn that not all walks need to be smell walks, but she will be delighted with the news that she deserves frequent smell walks. She sort of gets them already: The rules are that the dog gets to decide what direction to head, when to change direction, when to stop, and when to continue moving. If you and the dog never make it down the front steps, so be it. Luckily, we don’t have front steps. I’d guess that it’s best to smell-walk one dog at a time, though Cali seems pretty happy with letting Jana choose smell sites. One must not head out on a smell walk when one is pressed for time. Especially if one is walking Jana; her smell walks could easily last from breakfast until dinner, especially if one remembered to bring refreshments for along the way. There’s a lot more to the book than smell walks, though. There’s a lot of science, much of it having nothing to do with dogs but lots to do with smells. There are some great chapters on working dogs that barely scratch the surface of what career options are out there for dogs with working noses. There’s also a description of Horowitz’s experience taking her dog to a nosework class. He, like Jana, was a natural. But her descriptions of some of the other class members, nose-impaired and inhibited, were very sad. Nosework classes are a dog’s idea of heaven on earth. The dog is in charge. The human cannot tell her “no” or hold her back. She gets to climb on things and under things and stick her nose anywhere she wants to. She can bark as much as she wants. And the reward for finding something smelly is a ton of treats. Not hard to figure out why Jana loved it. Cali would, too. She deserves a smell class of her own, come to think of it. The book is definitely worth a read. 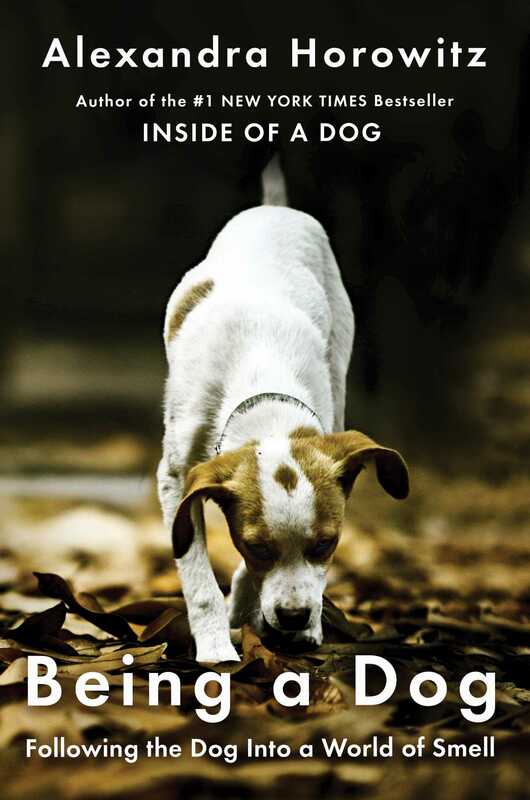 Horowitz’s last book, Inside of a Dog, was billed as offering insight into how dogs experience the world. But I think that Being a Dog does a much better job of that. Scent is what defines the dog’s world; as much as most humans rely on what they see to understand the world, dogs turn to scent. Gaining a better understanding of what that means is the best way to try to understand dogs. When you’re done, sign your dog up for a nosework class. Maybe Cali and I will see you there!